All sacks are Hemmed at Mouth, 3 (Blue) Vertical Stripes in Middle with Overhead Dry/Herackle Sewn at two sides. 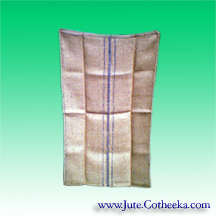 Cotheeka Jute Industry also supplies custom made jute bags made of both sacking cloths and Hessian/Burlap cloths. Feel free to contact us for any kind of Grain Bags, Corn Sacks, Sugar Bags, Flour Bags, Gunny Bags, Food Grade Jute Bags for packing agricultural commodities like Coffee & Cocoa beans, Vegetable Oil Treated (VOT) Jute Bags, Sand Bags, Cotton/Wool packs, Onion/Potato bags, Shoe Bags etc. All kinds of jute bags from light weight Burlap Bags to heavy duty jute bags are manufactured.